The number one thing I hear from my clients is that they’re BUSY! I get it, ’cause I am too! That’s why I meal plan almost every single week. Focus on simple, hassle-free recipes to keep you healthy through the week. 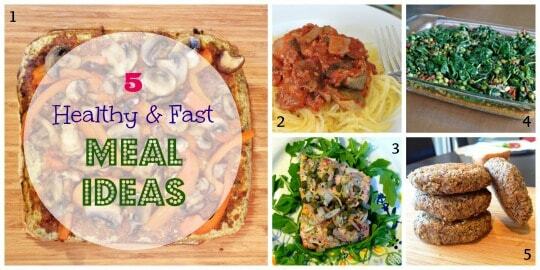 Here’s a recipe round-up of five super healthy, quick dinners for you to make! This recipe uses cauliflower as the crust, so it is entirely gluten and dairy free. It’s also paleo, since cauliflower and almond flour substitutes for the usual grain flour. A healthy take on your favourite comfort food, this recipe actually uses spaghetti squash as the base instead of noodles, topped with a yummy meat sauce. Salmon is one of the best forms of Omega 3s, a fat that we need for healthy skin, to help prevent heart disease and to improve brain function! This popular recipe is totally fool-proof: Perfect for post-work brain. Another fun take on a typically unhealthy dish is this sweet potato tart. Grated sweet potatoes make up the crust, instead of a regular pastry! Last, but definitely not least, are these gluten free black bean burgers. Full of vegetarian protein, black beans are also a great source of fiber! Have you made any of these recipes?? Let me know how they turn out!